L1 Energy, a Russian-owned company, has bought oil and gas fields in the North Sea. Undeterred by the fact that Russia is under sanctions and that rhetoric between Russia and the EU continues to be shrill, the company could spend several billion dollars on similar transactions in the future. 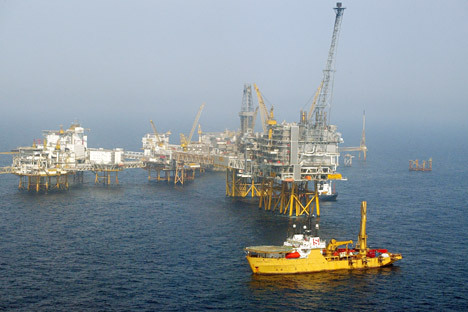 L1 Energy, a company owned by Mikhail Fridman, founder of Russia's largest financial corporation the Alfa Group, has bought oil and gas fields in the Norwegian North Sea from a German company E. ON, for $1.6 billion. According to reports in the Russian business newspaper RBK-Daily, the deal, which has been approved by supervisory authorities of Norway and the European Union, has resulted in the Russian investors getting 43 mining licenses and becoming the owners of the largest oil and gas fields in the North Sea. "This is the largest transaction done by a business under the control of Russian businessmen in recent years," said Ivan Kapitonov, associate professor at the Russian Presidential Academy of National Economy and Public Administration; a research institution close to the government. According to Kapitonov, the deposits will allow L1 Energy to become a major international oil and gas company. Despite many Russian companies, including major banks and the oil company Rosneft, falling under European Union sanctions imposed in 2014, to punish Moscow for its role in the Ukraine crisis, Russia's largest financial corporation Alfa Group has avoided this fate, as sanctions were primarily directed against state-owned Russian companies. However, as analysts noted, it has become difficult even for private Russian entrepreneurs to work in the European market. Except for L1 Energy, investors from Russia have not attempted such transactions in the European energy market. Sergei Ilyin, an analyst at Premier, said that "L1 Energy was originally created for investments in the energy sector, and initially focused on foreign projects." According to Ilyin, this is a pretty big deal, considering that Russian companies are now cautious about investing in foreign projects. Secondly, as Kulikov noted, the transaction is a kind of compensation for Fridman for the forced sale of North Sea gas fields owned by L1 Energy to the Swiss chemical company Ineos, a transaction made under the pressure of the UK's Department of Energy.Sergei Ilyin, an analyst at Premier, said that "L1 Energy was originally created for investments in the energy sector, and initially focused on foreign projects." According to Ilyin, this is a pretty big deal, considering that Russian companies are now cautious about investing in foreign projects. L1 Group was established by Alfa Group's shareholders in June 2013 after the sale by Russian state company Rosneft of its stake in the joint venture TNK-BP – Russia’s largest oil company with British capital. For their share, the future founders of L1 received $13.86 billion. In March 2015, Fridman's group bought the German group RWE’s British division DEA UK for $5.8 billion. However, before the closure of the transaction, the UK authorities stated their objections to the deal and demanded that the Russian investors sell oil and gas fields located in the North Sea. As explained by the British government, entrepreneurs might be included on the EU sanctions list in the future, which would jeopardize the production of hydrocarbons. Eventually, it was announced on Sept. 11, 2015 that L1 had sold a stake in its British fields to the Swiss chemical company Ineos. According to Reuters, the company expected to receive $1.2 billion for these assets, but the maximum amount offered for the deposits was $750 million.